A new YieldCo goes after middle-market developers of solar and wind for its IPO. When we predicted the IPOs of 2014, we suggested we'd see more YieldCos from firms like SunEdison, SunPower and First Solar. Add Sol-Wind Renewable Power to that list, with one of the more modestly sized YieldCos to be floated. 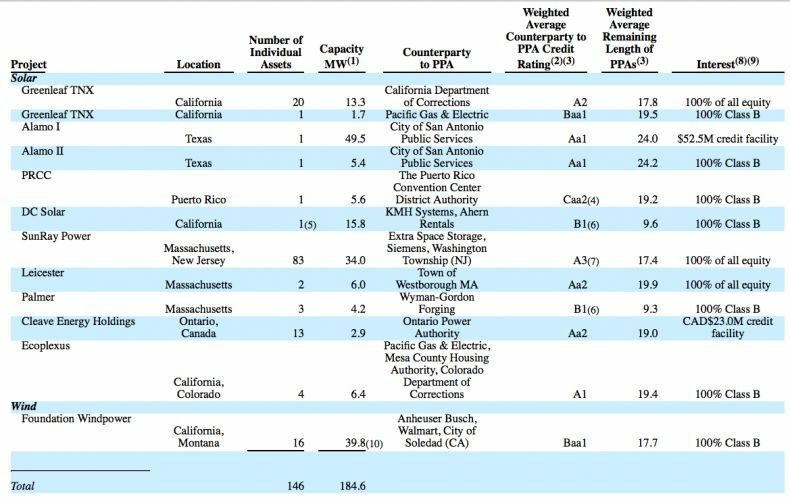 Sol-Wind is an aggregation of 184 megawatts of mostly solar assets (with some wind) in the U.S., Puerto Rico and Canada that just filed to go public on the New York Stock Exchange. The firm looks to raise $100 million in this IPO. UBS Investment Bank and Citigroup are leading the transaction. Backers include hedge fund 40 North. The S-1 notes, "These assets generate power for retail, municipal, utility and commercial customers under long-term power-purchase agreements or similar contracts ("PPAs") that generate stable, long-term contracted cash flows. The company's objective is to pay a consistent and growing cash distribution to shareholders on a long-term basis." That's pretty much the definition of a YieldCo. The CEO of the YieldCo is Scott Tonn, the former chief of solar distributor SunWize Technologies. Last year Sol-Wind had income of $4.9 million on revenue of $22.1 million, according to the S-1 filing. The company estimates 2015 revenue of $41.8 million. "We are focused on acquiring assets from middle-market developers, which is an area where we see particularly compelling opportunities. We define 'middle-market developers' as those developers who typically, in the case of solar assets, develop projects of between 100 kW and 5 MW in nameplate capacity and, in the case of wind assets, between 1 MW and 10 MW in nameplate capacity." "We have established and continue to grow and form new relationships with middle-market developers of high-quality, long-life assets with long-term contracts serving creditworthy counterparties, but whose ability to construct new generation facilities has historically been constrained by the inability to consistently raise capital. In contrast to some of our competitors, we are not a subsidiary of a large developer and therefore we believe we have greater flexibility in sourcing potential assets from a variety of developers and in choosing the right assets for our portfolio. In addition, we believe we will have a competitive advantage in sourcing acquisition and investment opportunities because of our master limited partnership ("MLP") structure. We believe our structure allows us to utilize low-cost capital in the form of tax equity without affecting our ability to maintain an attractive level of distributions. We intend to leverage these advantages in executing on acquisition and investment opportunities, which will ultimately enable us to grow our distributions." Cleantech companies that went public in 2014 include Opower, Vivint Solar and SunEdison's TerraForm YieldCo. TerraForm has a market cap of $2.78 billion. Other YieldCos that went public in in 2014 included Abengoa Yield and NextEra Energy Partners. TCP International, an LED and CFL lighting firm, went public on the NYSE in June. Aspen Aerogels finally got through the IPO window with its high-performance insulation, while Intelligent Energy and its fuel-cell aspirations went public on the AIM. Solar PV microinverter maker Enecsys went public on the AIM as well. OneRoof went public on the TSX Exchange through a reverse merger.